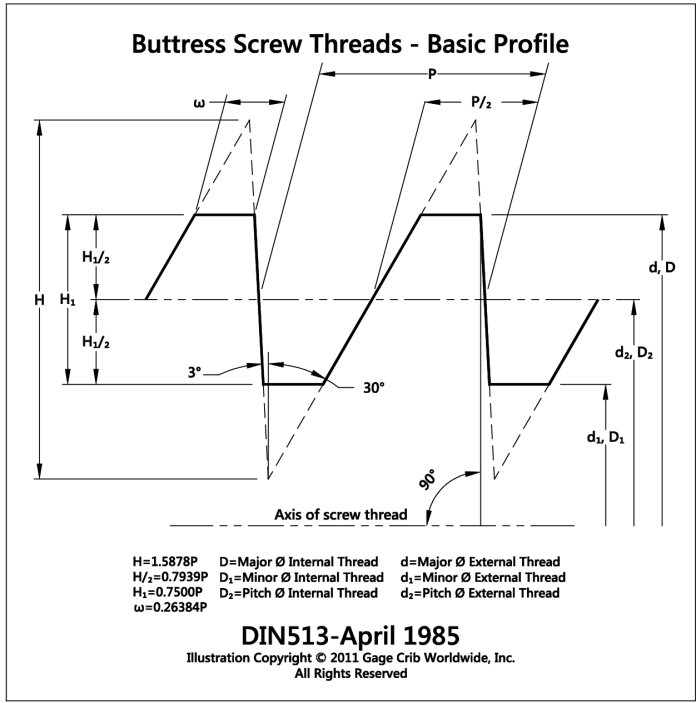 The data provided represents only the smaller sizes of the medium fit for a normal length of engagement S-series Metric 3°/30° Buttress Screw Thread. Many other permutations of the thread form are included in the DIN 513 root documents. This data is provided for general information only. The intention is to provide accurate information; regardless; errors may exist in the supplied information. If accuracy is critical, base your final decisions on the data provided in the root document: DIN 513 (this data was taken from DIN 513:1985 Parts 1, 2 and 3); which are copyrighted documents. To purchase your own copy visit an Authorized Reseller.